It's Duck Soup: Duck Soup Brings Home the Bacon! 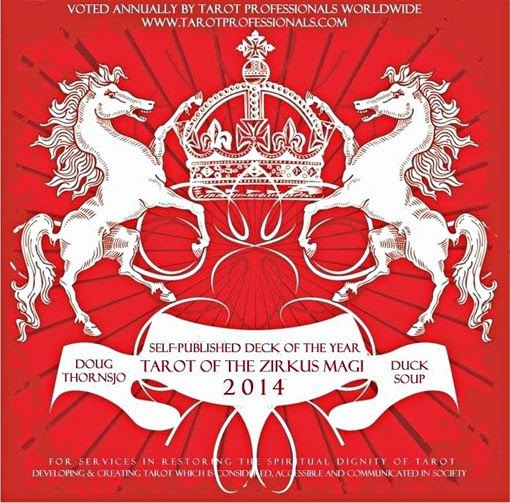 Just like Peter Pan, I gotta crow: My TAROT OF THE ZIRKUS MÄGI was just voted Self-published Deck of the Year in the 2014 Tarosophy Awards, voted by Tarot Professionals. Additionally, it's going to be featured in the next issue of Somerset Digital Studio, available at better newsstands and art stores nationwide. Congrats, Doug. I'm so pleased to see you get recognition for your hard work. Bask in the glow and unleash the creativity. You have more, many more projects to bring to life.